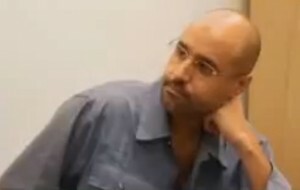 Saif Al-Islam Qaddafi is well and free to move around Libya or abroad, the undersecretary in the Beida-based Thinni administration’s justice ministry claimed today. Talking to the media office of the Abubakr Al-Saddiq brigade which has guarded Saif since it captured him in 2011, Eisa Alsaghir confirmed that as far as his government was concerned, the former dictator’s son can go wherever he wants, like any other Libyan. “Saif is free under the terms of the general amnesty law issued by the House of Representatives (HoR) in July 2015,” he said. According to reports, though, while Saif is no longer under house arrest he remains under guard in Zintan “for his own protection”. Alsaghir’s statement also appears to contradict one earlier this month by Zintan military council which denied claims by the International Criminal Court’s chief prosecutor Fatou Bensouda that Saif had been released. A Zintan court reportedly freed him in April 2016. Since then, his whereabouts in the town and the nature of his stay there have remained something of a mystery. Al-Saghir is also wrong in saying that Saif is free to travel abroad. The ICC warrant for his arrest remains in effect and would almost certainly be acted upon were he to go to any other country. Al-Saghir is on a working visit to Zintan and Rujban, inspecting the workings of judicial authorities in the two places. During his interview he also confirmed that funding issues for the Abubaker Sadiq brigade be addressed. “The brigade under leadership of Colonel Ajmi Al-Atiri is doing a great job given that they have been neglected financially but we will solve this,” he added.